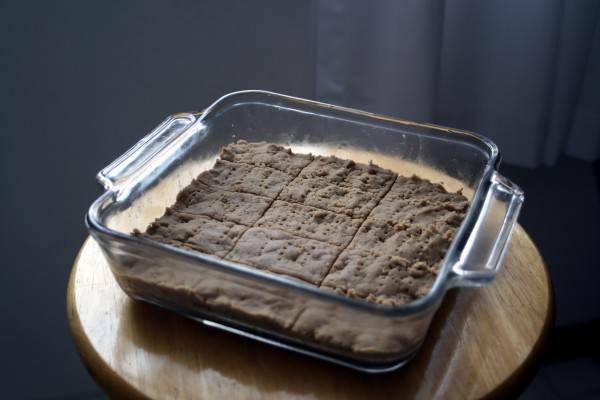 On the third day of Christmas, my true love gave to me: Brown Sugar Whole Wheat Shortbread. And then he ate it all. Seriously. I made this yesterday afternoon. When I peeled back the foil today this is what I found. A few more minutes, and I would have been taking pictures of crumbs. I don’t typically go in for shortbread. Yes, it’s buttery and rich, but it’s also usually kind of dry and blah. This shortbread uses dark brown sugar to lend a sumptuous molasses note, and white whole wheat flour provides a pleasant nuttiness. This recipe also isn’t as dry as your standard shortbread cookie, so it’s easier to cut and doesn’t necessitate immediately consuming a vat of milk. However, it is lovely with a cup of tea, cocoa, or a reasonable-sized glass of milk. 2) Add in flour and salt, and mix on low until very well combined. If you make a lot of cookies, you are used to barely mixing the dough at this point. 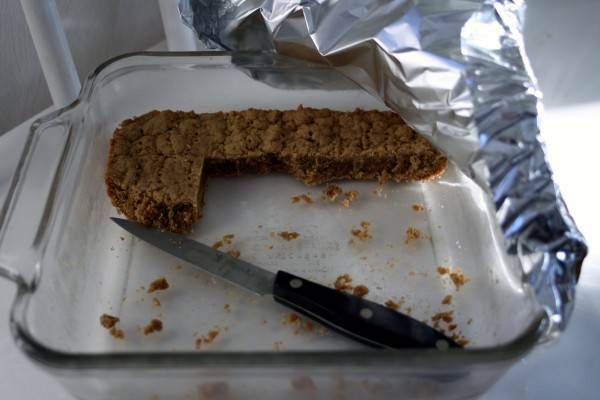 However, here you want to make sure the butter is well worked into the flour, or your bars will be super-crumbly. 3) Preheat oven to 325 degrees. Scrape the mixture into a buttered 8×8 baking pan (mixture will be crumbly, but not dry.) Press evenly into pan. Lightly score bars where you would like to cut them, and then prick all over with a fork. 4) Bake for 25-30 minutes, until top is puffy and firm. Cool pan on a rack for several hours, then cut.